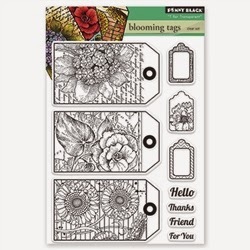 Just a quick post of another card I made with this stamp set by Penny Black called Blooming Tags. I stamped the image with Black Archival Ink. I colored the image with Ranger Distress Markers and a water brush (my favorite medium, lately). After coloring the flower, I "colored" it again with my Wink of Stella Glitter Brush, to add some shimmer. I then fussy cut it and adhered to my card. Very simple, but very elegant! This is drop dead gorgeous Mackie!! Love every perfect detail!! Gorgeous card Mackie! That blue blossom looks stunning! Wow, MM, this is lovely. I like how you painted the images, inked the edges of your card, and the DP down the side too! OMGosh what FAB stamps! Your flower just POPS off the tag! LOVE the colors and the strip of patterned paper, too!